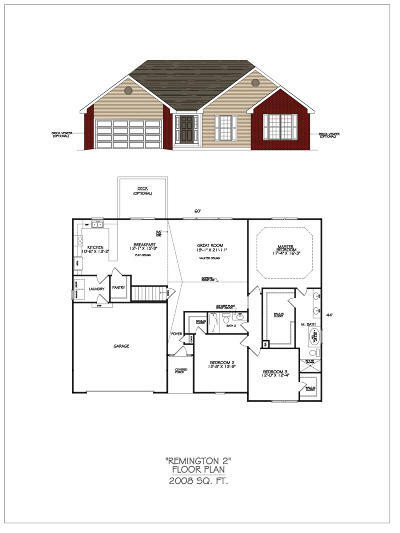 The Remington 2 unfinished basement floor plan with 3 bedrooms, 2 full baths and a 2 car garage with 2008 square feet finished. Great room will have a vaulted ceiling with a ceiling fan. Kitchen includes an electric range, dishwasher, microwave mounted above the range and disposal. Laminate counter tops, stainless steel sink, walk-in pantry, breakfast bar and a dining area. Master suite will have a pan ceiling and a ceiling fan. Master bath has double sinks, cultured marble counters and large walk in closet. This home will be built on over 5 acres just south of Hollister.